there is something sacred and intimate about having the sun go down around you when you’re in a room by yourself. Phase 4: it’s dark, quiet. not enough light to read, but I don’t want to turn on my lamp. I reach for it, but stop. no one knows I’m home. I’m introverted today, so I like it this way. even my music is off now. no words. no voices. no sound. calm. it’s funny how the ingredients for loneliness can also be a delicious blanket of comfort. I stare out my window in complete contentment. goodnight, day. *one thing is omitted from phase 4. there were words. -akindoflibrary.blogspot.com- there was a dearest friend and teacher and a bit of poetry. and you can’t read an author like her without wanting to write a bit yourself. i love you dear friend. you are the best kind of writing partner. my stone of remembrance. 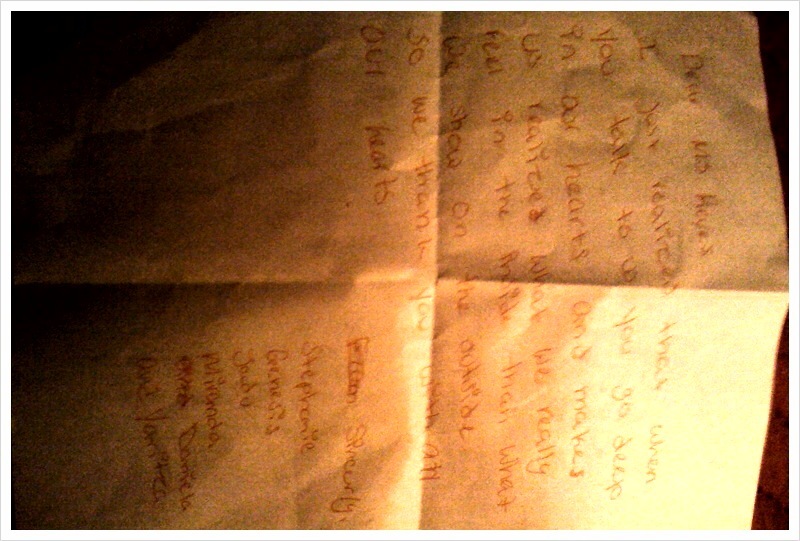 a poem from the girls. All teachers have this kind of stash. Letters, post-its, pictures. Remnants of glory. Stones of remembrance. It reminds me of the Old Testament story. The people of Israel were told by God to “lay up stones of remembrance” to declare God’s protection and favor. This was so that years later, as the Israelites journeyed past the stone, they could rejoice and remember their deliverance. And be reminded that deliverance would come again. So I keep a stash… and in the rough times, it reminds me that I’ve had some sweet days.. and sweet days will come again. Today I broke up 2 fights. FIGHTS. I used to be able to promise that those things didn’t happen in “my class.” Oh i have been humbled. But. that’s not the story. In addition to all of that, I found myself in a 15 minute conversation -mid class-with a student over friend troubles. (Her best friend was taken from her home and is now in foster care. We don’t know where she is. We all miss her. Especially her best friend.) Imagine dealing with middle school drama WHILE your best friend has just been ripped from your life with no explanation. So I ignored the 31 other kids to talk to her. You can’t say no to hurting tears of your students. So we talked and cried and I sent her back to her seat. Within seconds, I hear from across the room (so much for a “private” conversation): ” Ms. Reyes.. you just.. i just…you always make us cry!!! Like in our hearts! ” I felt a little invaded that they’d heard my conversation. But let’s be real. I also loved it. Then, the second eve’s dropper walked up to me and granted me with the most beautiful benediction of a comment. I GUSHED.. called it Poetry.. and begged her to write it exactly as she spoke it. And she did.. thus, giving me, my newest, most prized STONE of REMEMBRANCE. So we thank you with all our hearts. So today… the day I broke up a fight.. and heard the F word in my own classroom, I also received a sweet gift. A stone. I will look at it to rejoice. I will look at it to remember. I will look at it to hope. I love my job. I also found this entry recently. It’s dated just several months before I began my own teaching career 7 years ago. Exactly 7 years ago. 🙂 I WAS aching to teach. 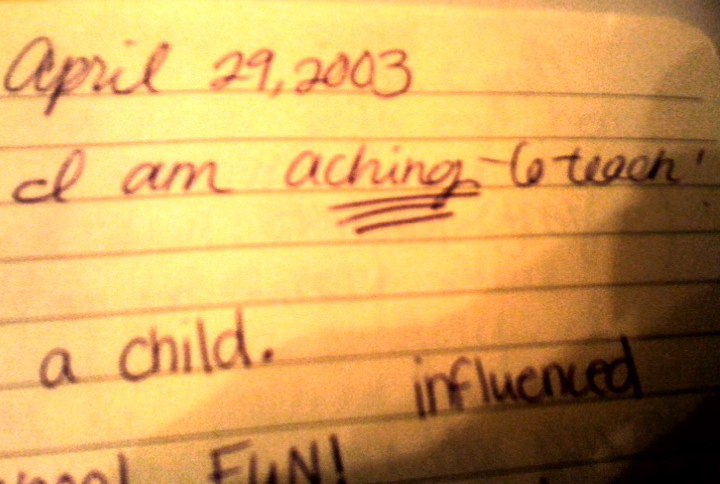 I kinda love that nothing about that statement has changed. I love that I look at this and smile as I remember I AM A TEACHER. email. text messages. instant messenger. the facebook status. the facebook comment. and if you want to go “personal” you have the facebook message. forget pen to paper. it has been replaced. by us. Writing used to be the way wars were started or stopped. the way love was professed. the way slaves found their way to the free side. writing was the way we held on to the special things, stories, lives… writing could change the way life was. and now we update our status. don’t get me wrong, cultural literacy is fascinating and has its place. but. in our efforts to swim with the flow of our ever changing world, we have lost something. I received many “love letters” as a teen and even on into college. One I distinctly remember began, ” Dear Lindsay (..must mean beautiful).” Even now, I am transported back in time to the symphonic band concert in the Wren High School auditorium where I unfolded the letter and read it as my friends Melissa and KB squealed over my shoulder. Bobby Powell got it right. Not by his comment, but in knowing that a letter held (and evoked) great power and passion. It lasts. beyond years and relationships. It has the power to transport.. to comfort… to tell the truth we may not be able to say out loud. I am reflecting over this in hindsight. Apparently, I am now a letter writer. I just realized it today as I added two more letters to my “sent box.” It began as 1 letter I wrote to my hero of teacher heroes. The second was to my principal advocating for myself to take off work a 1/2 day to see my hero of heroes teach one more time. What could have taken 1 paragraph turned into a full page. Note: lesson 1-putting your heart on the page can change people’s mind. Then came the note to my old clarinet professor, Dr. Robert Chesebro. I felt like Martin Luther as I wrote with great passion and tacked my letter firmly in the center of his door. It was no 95 Theses, but I put my heart on the page and wrote to the man who introduced me to great beauty in the realm of music and life. I miss him. And he needed to know what he’d done for me. So I told him. in a letter. There’s something sweet about powerful words that last. Who do you need to tell something to? Whose door would you tack a letter of the heart to? They hold and evoke so much, don’t they? Sometimes they are merely to deal with the heart, or to share thankfulness. Other times, they are for encouragement. A those few, special times, they are asking people to take a chance on you. But they are there. Oh are they there. In our hearts, waiting to be shared. Spring is all around. 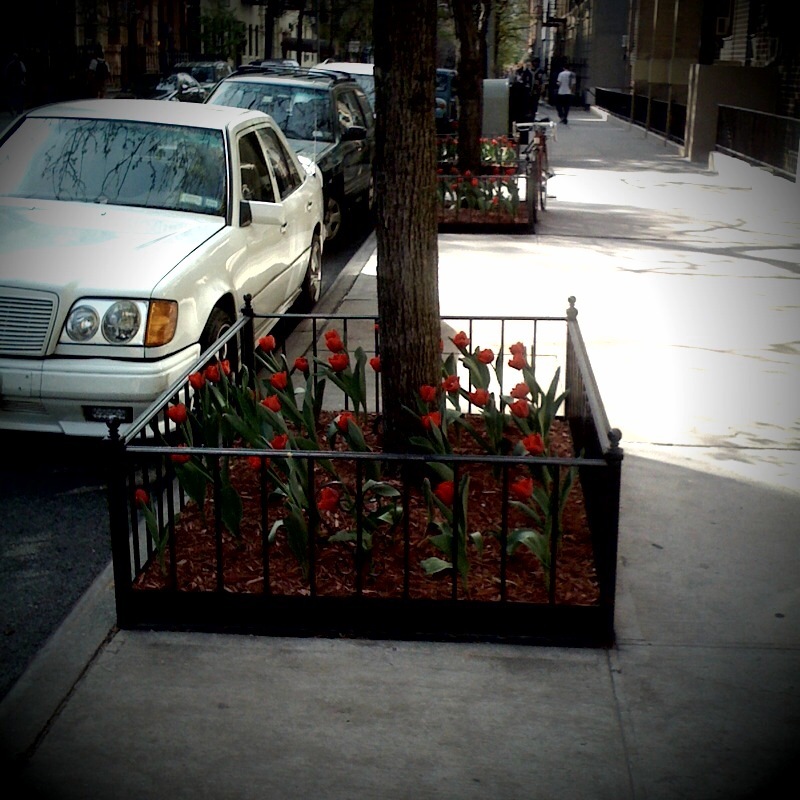 Tulips are bursting out from every nook and cranny of the Upper West Side. I walk by them and smile as if they are there just for me. Also, my sadness over saying goodbye to the white of the bradford pear trees is giving way to the glorious light green that now lines my street. No time for sadness. Beauty is bursting forth.. there is something new every day! It reminds me that you never know what may happen, what beauty will trip you up tomorrow. It reminds me that the things you want be just be. right. there. —— When I was student teaching, my fabulous angel of a mentor gave me a book to keep me company during my two weeks of HOURS of “hall monitoring” for the state tests. Hours of silence interrupted only by a few bathroom emergencies by cutie-pie 8 year olds. “Here, I think you’ll like this one, ” she said. The book “In the Company of Children” looked brilliant, with it’s purples and pinks and blues splattered all over the cover. My kind of book already. “Sure, thanks, I said. ANYTHING to keep me company.” Little did I know, my life was about to change. Let’s see if I can be succinct. Probably not: “I do my best work in the company of children” were her first words that echoed my own heart. I needed to know this teacher and who in the HECK her colleagues were. They were at the Manhattan New School. I wanted to be them. They were the Teachers College Reading and Writing Project. I needed to be them. I googled TCRWP. Spent a whole paycheck on a week long summer institute. Got wait listed. Was shown mercy (whoever you are who answered the Reading & Writing office phone that day and squeezed me into Rose Greco’s section, I owe you my LIFE.) I attended. Fell madly in love with Reading and Writing. And finally. Moved to New York City, where I will stay and teach forever. 8 Years Later, as I was walking passed these tulips and tree lined streets, I thought, I must do it. But I thought, Of all the connections I have, I need to do this one on my own. I found a starbucks. (Thank you 84th st.) I opened my computer. And 4 replays of Chopin’s Fantasie in C sharp minor later, this is what I had. And this is what sent. I have waited 8 years to send this letter. Only now do I feel even close to worthy to send it. In 2002, as a student teacher, I poured over the pages of “In the Company of Children” as Shelley Harwayne and Joanne Hindley talked about Manhattan New School– about your vision, your mission, and your hope for children of the City. EVERYTHING I wanted education to be was found on the pages of that book. It was then that I dreamed of being a teacher in the Manhattan New School family. As a first year teacher, I spent an entire SC teacher paycheck on a TC Reading and Writing Project Summer Institute and my soul was IGNITED! Right then and there, I made a decision to move to New York City to teach. Of COURSE I wanted to teach at your school, but I knew I wasn’t ready. I had also begun to develop a calling for impoverished schools in the South Bronx, so my heart led me there. I’ve been teaching in the South Bronx at MS 223 (a TCRWProject model middle school) for 4 years, where I have helped struggling readers and led my kids to see beauty in their lives through reading and writing. I have now been to dozens of institutes, participated in multiple TC leadership groups with Mary Ehrenworth, and have worked hard to develop my craft as a teacher, reader, and writer. It has been a sweet and powerful time in my life. Now, I am ready for the return to elementary school and of course PS 290 Manhattan New School flooded my mind. If you have a vacancy and are in need of teacher who believes in the heart of your school, I believe I can be that person. I am almost certain that you have no positions open for the fall of 2010. But if you happen to, I would be truly grateful for an opportunity to meet with you. I believe with all my heart that I would make a strong addition to your team. After all, YOU are the very school and people who shaped my vision of education. I have heard that everything I hope and believe to be right and true about education is a reality behind those red doors of yours. I am attaching my resume and philosophy of education. I would welcome any opportunity to sit down and discuss how I may add to your amazing family of teachers and learners. I look forward to hearing from you soon. Thank you for your time! Have a wonderful day. there was no wind today. they were reaching for life. Katherine Bomer once again invites us to sink into a reading experience that will ignite our teacher hearts! Ever sit down to read a student’s piece of writing and feel like you’re grasping for a compliment? Feel like you only notice what to TEACH them? There is beauty. It is there, and Katherine is pulling us closely to show us. This book won’t tell you how to see the beauty in the hidden places, but rather to LIVE in such a way that we see the beauty and brilliance that ALREADY exists on the pages of our young writers. Brilliance is there, and Katherine simply illuminates this for us. Then, she takes us by the hand and shows us how to see it, what to say to our kids, and how to invite our colleagues along. Bonus: The appendices are filled with concrete ways to immediately implement the ideas you read about!Ultimately, this book will excite you, help you expand your vision and vocabulary for talking back and encouraging this brilliance, and help you water an already growing classroom of writers! happy reading! You can get the book on Amazon, or a bit less expensive at Heinemann.com. 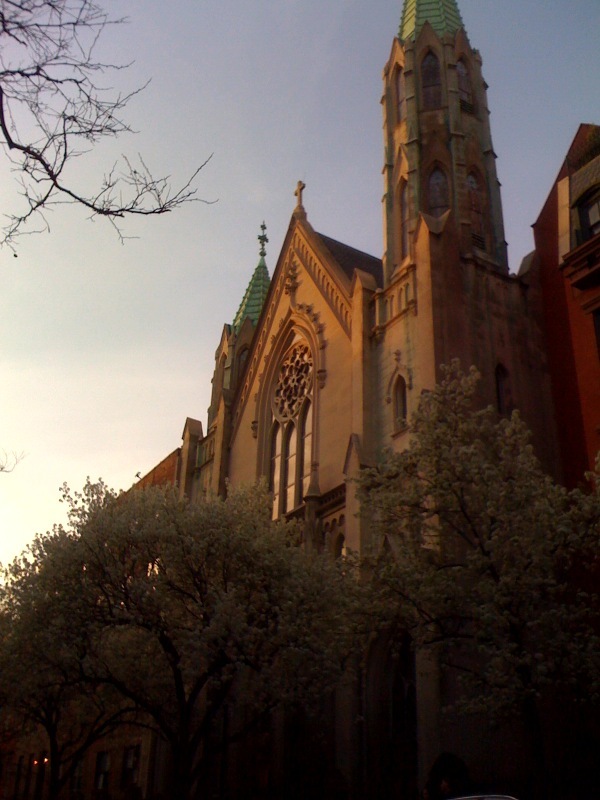 Last night, after a beautiful Maundy Thursday service in Chelsea, I ambled through the serene neighborhood with a sense of great hope and excitement. Easter tends to do that. After a long cold winter, Spring calls forth that which has appeared lifeless. EVERYTHING is made new again. There is beauty everywhere. What once appeared lifeless is singing the song of renewal. Only one block from the church sits a school, PS 11. PS 11, whose mission speaks of kindness, gentleness, and self-control. PS 11, whose walls got to eavesdrop on a hero teacher as she taught every day. 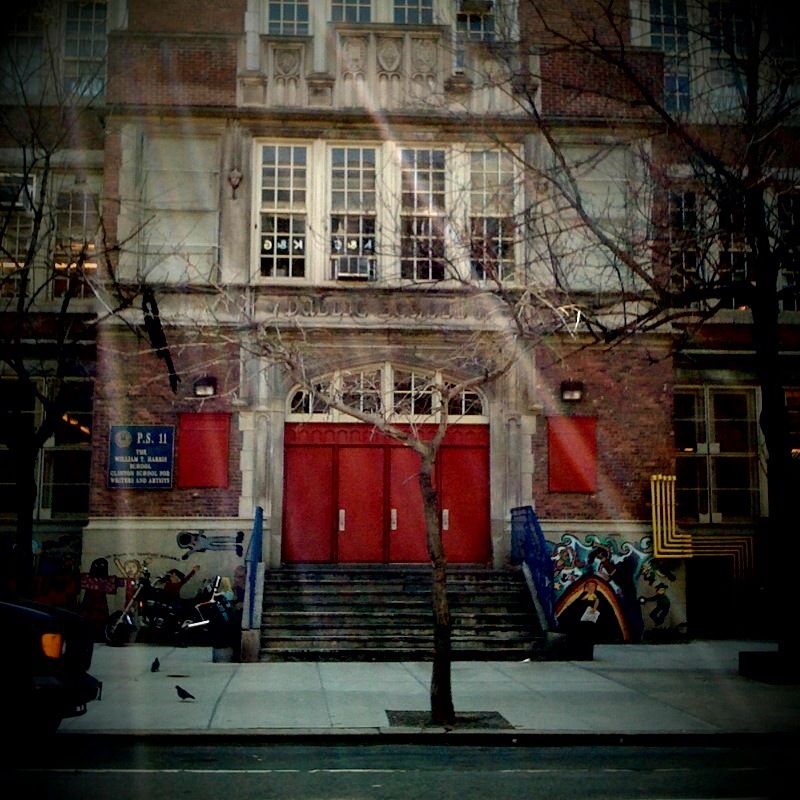 PS 11, with it’s red door and painted pictures.
. . . Where I have an interview this Wednesday. Out of curiosity and excitement, I decided to have a look. (Think “tearing at the corner of a Christmas present before you’re supposed to open it” type of look.) My walking breaks into a -let’s be honest-skip until the school enters my view. I slow down.. is that it?! That’s IT. My eyes can’t keep up. Red door, words, pictures, quotes, steps, enormous windows, trees, brownstones… I do the only thing I know to do in situations like this. I squeal. 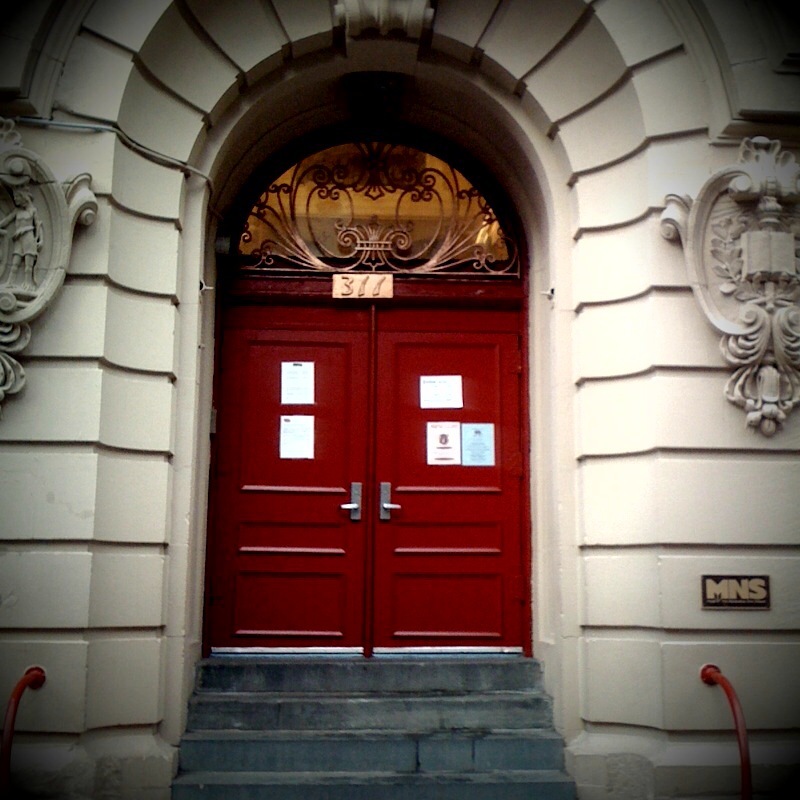 I am almost 30, and I squeal at red doors to school buildings. If you were me, you would too. I could now go into a long tangent of thought about how I’m always afraid to want something too badly or how if I like something too much, it will end not so happily-ever-after. But tonight, that isn’t the truth of the moment. At least right now. As I learn more about memoir, I learn that it is about truth. The truth of this moment is that after my grown-up, middle-of-the-street squealing, just before I could begin all my doubting, a dear best friend (who was with me all along) pulled me up to the big red doors. She put her hand on it, looked up with a gigantic smile, and she prayed for PS 11. Prayed! (?!) She prayed for the kids, the artists and writers and dreamers they are; that they would be the grownups that shape our world into a better place. Then, my heart and I took a deep breath of hope, and walked away into the night. * Note: I am absolutely terrified that I have begun to want this too much. Endnote: It’s now May. I had the interview. I saw the inside of the school-the magic behind the red doors. The truth is, I tried very hard to make it be the place I wanted it to be. But it wasn’t. Turns out, there are other P.S. Somewheres that are calling my name.. and my heart toward a new home.